232 pages | 14 B/W Illus. Across the globe, political movements opposing privatisation, enclosures, and other spatial controls are coalescing towards the idea of the ‘commons’. As a result, struggles over the commons and common life are now coming to the forefront of both political activism and scholarly enquiry. This book advances academic debates concerning the spatialities of the commons and draws out the diverse materialities, temporalities, and experiences of practices of commoning. Part one, "Materialising the Commons" focuses on the　performance of new geographical imaginations in spatial and material practices of commoning. Part two, "Spaces of Commoning", explores the importance of the turn from ‘commons’ to ‘commoning’, bringing together chapters focusing on the "doing" of commons, and how spaces, materials, bodies and abstract flows are intertwined in these complex and excessive processes. Part three, "An Expanded Commons", explores the broader registers and spaces in which the concept of the commons is at stake and highlights how and where the commons can open new areas of action and research. Part four, "The Capture of the Commons", questions the particular interdependence of ‘the commons’ and ‘enclosure’ assumed within commons literature framed by the concept of neoliberalism. 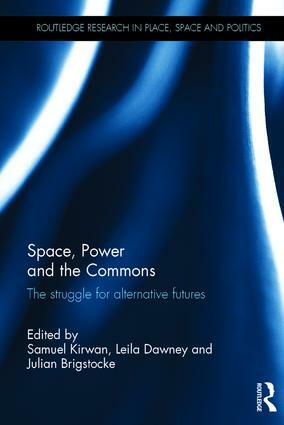 Providing a comprehensive introduction to the diverse ways in which ideas of the commons are being conceptualised and enacted both throughout the social sciences and in practical action, this book foregrounds the commons as an arena for political thought and　sets an agenda for future research. Samuel Kirwan is a post-doctoral research associate, Socio-Legal Studies, Bristol University, UK. Leila Dawney is Senior Lecturer in Human Geography, Brighton University. Julian Brigstocke is Lecturer in Human Geography, Plymouth University, UK.